The Internet of Things may come - CrumbX1-NET V1.2 is a highly integrated embedded internet ethernet module with the Atmel AVR ATxmega128D3 microcontroller, CP2201 ethernet controller, transformer, RJ45 modular jack, USB interface and a micro-SD card slot and provides a convenient and simple to use solution for Internet of Things applications. The CrumbX1-Net ethernet interface is based on Silcon Labs CP2201 10Mbit ethernet controller with integrated phy. Additionally the ethernet transformer is already integrated on Crumb644-Net, hence no high-cost RJ45 jack with integrated transformer is required! A simple RJ45 header is suitable for connecting the Crumb644-Net to the network. 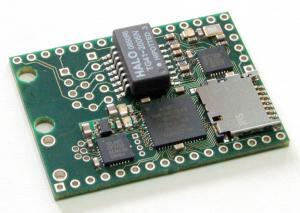 In addition to the ethernet interface a USB UART converter is integrated on the board, which is a comfortable way for ethernet configuration or to show debug output during development. uIP is an implementation of the TCP/IP protocol stack, optimized for small 8 bit microcontrollers. uIP provides all necessary protocols for internet connectivity, with a very small code footprint and RAM requirements. uIP is open source software, developed in C and may be freely used in both non-commercial as well as commercial projects. uIP is covered by the BSD-Style License. Further information in uIP is available on the uIP/Contiki homepage. A port of the uIP Embedded TCP/IP Stack and webserver for the CrumbX1-Net is available: NET-IO-Modul Firmware V2.11.11 (uIP Stack, Webserver, Email, etc..
For Windows and Atmel Studio 6 users we have extended the firmware by Stefan Frings by an Atmel Studio 6 project: NET-IO-Modul_v2.11.11_2013-05-21_Studio_6.zip. CrumbX1-NET is shipped without pin headers, since everybody likes different types (up, down, male, female, etc.). A Connector Kit with high quality pins and receptacles, link LED, RJ45 connector and mini USB connector can be ordered as an option. 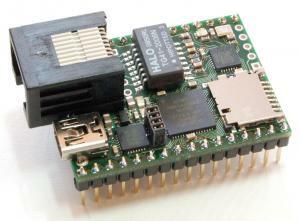 NET-IO-Modul Firmware V2.11.11 (uIP Stack, Webserver, Email, etc. Die NET-IO-Modul Firmware V2.11.11 von uns um ein aktuelles Atmel Studio 6 Projekt ergänzt!